Fighting Fantasy Fest 2014 - May it's STAMINA Never Fail! Every felt that Fighting Fantasy should have had conventions like Dungeons & Dragons did in the 1980s? Well now is finally your chance to experience an event like no other! 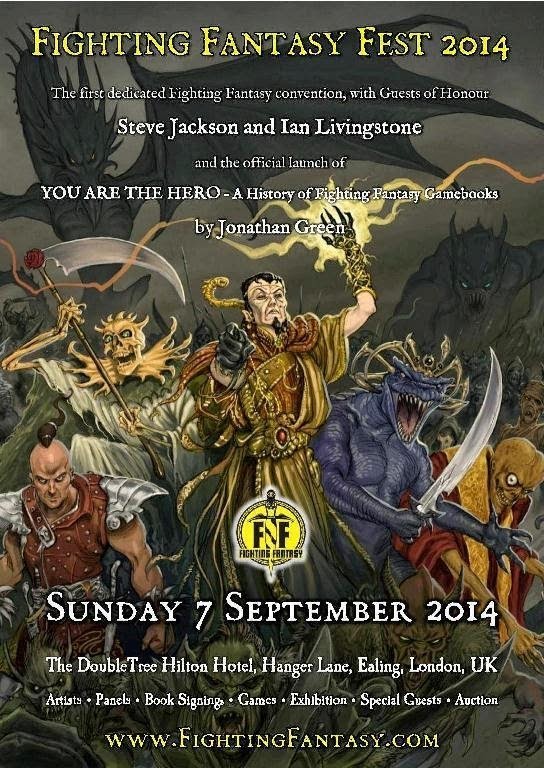 As part of launching his new book about the history of Fighting Fantasy, You are the Hero, author Jonathan Green has organised the first Fighting Fantasy convention in London this September. Creators Steve "Creature of Havoc" Jackson and Ian "Deathtrap Dungeon" Livingstone will be present, alongside a host of other Fighting Fantasy which includes Russ "The Citadel of Chaos" Nicholson, Chris "Temple of Terror" Achilleos, and Tony "Night Dragon" Hough. Arion Games, Tin Man Games, and inkle Studios will also all be present. Sadly, being in New Zealand, I am unable to attend. But I wish all those who do a fantastic day. If you are within easy distance (or slightly inconvenient distance even!) then mark Sunday, September 7th on your calendar and book your tickets now!